Robert Mayers – Deputy Leader of CoP and former Managing Director of CMMB – Mayers retired in November 2008 and was reportedly the financial adviser to Lawrence Duprey. Mervyn Assam – Former Trade Minister with UNC in the 1995-2000 period and UNC Senator up until the dissolution of Parliament in April. Assam was a founder of CLICO Investment Bank (CIB) and its last Chairman before the collapse. Despite the heat and temper of the election campaign, we have heard nothing on the role of Assam in the collapse of CIB. Yet again, the ‘Code of Silence’ is suspected, by negative inference, as it were. There seems to be some tacit agreement between the contending parties on this controversial matter. Dr. Bhoehendratt Tewarie – Former Principal of UWI (St. Augustine), Director of CL Financial and Republic Bank Limited at the time of the collapse. The Foundation for Politics sand Leadership, which was founded by some of the leading figures in the Congress of the People (CoP), headlined Dr. Tewarie to speak at their January 16th conference ‘Thinking Ahead – Governance in the 21st Century’. Tewarie is reported to have been one of the Directors who was present at the last Annual General Meeting of CL Financial on 23rd January 2009 at Trinidad Hilton. Yes, that is 7 days after they paid the final dividend; 10 days after they wrote the Central Bank and 7 days before announcing the bailout. Again, Tewarie is also silent on those events in the CL Financial Boardroom. Carlos John – Former close aide of Lawrence Duprey and Director of CL Financial. Now visible at political meetings and has reportedly been recently canvassing in support of the PP’s St. Joseph candidate, recently-retired High Court Judge, Herbert Volney. It is easy to imagine these men playing an important part in any future PP government. In contrast, the two UNC MPs who, publicly and in advance, voiced serious concerns over the CL Financial group were economist, Trevor Sudama and former Attorney General, Ramesh Lawrence Maharaj. Both of those courageous individuals suffered the wrath of Mr. Panday and eventually found themselves sidelined. Ramesh was an MP in the last Parliament and ended up backing the very Basdeo Panday in the UNC’s recent leadership contest. 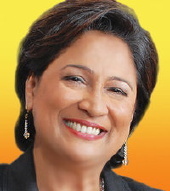 A twisted road indeed, but ultimately, with Kamla’s victory, Ramesh has now been excluded from the ranks of PP candidates in tomorrow’s election. Only those two individuals in our public life had the foresight and fortitude to sound the alarm on CL Financial. For whatever reason, we have now come to an arrangement of forces which has no room for those two men. Apart from the crucial Special Purpose Entities (SPEs), the CL Financial bailout has placed the entire group under State control. There are therefore substantial Directorships and contracts, within the very CL Financial group, to be dispensed. Audited Accounts – There is an immense variance between the asset value of the group as per their 2007 audited accounts ($100.7Bn as published on 18th November 2008) and as stated in their letter of 13th January 2009 requesting urgent financial assistance (a mere 56 days later, the asset value was stated to be $23.9BN). We need to have the audited accounts for 2008 and 2009 published without further delay. In any case, that publication is mandated by clause 4.4.5 of the Shareholders’ Agreement. Payment of CL Financial dividend – CL Financial paid a dividend of $3.00 per share to its shareholders on 16th January 2009, 3 days after writing to seek the urgent financial assistance of the State. Steps need to be taken to recover those dividends from the shareholders. Role of the Regulator – The Governor of the Central Bank has repeatedly told of the long-term concern over the risks inherent in CL Financial’s operations. We need to know if those regulators were at fault and to what extent could all of this have been avoided. Fit and Proper conduct of the Directors – The ‘Fit and Proper’ criteria which are essential qualifications for Directors and Officers of Financial Institutions, were clearly not followed, if we are to believe the public statements of the Governor. What is to be done with the offenders? Will a PP administration be willing or able to dis-qualify those Directors? Taxpayers’ protection for CL Financial shareholders – The Shareholders’ Agreement of 12th June 2009 extended the bailout protection to the shareholders of the collapsed group. For the interests of shareholders to be protected in this situation is contrary to good sense and violates elementary principles of good public policy. It is unprecedented anywhere else in the world, including Nigeria, as shown in ‘Finding the Assets’, published in the Business Guardian on 19th November 2009. Literally, it is a case of ‘Only in Trinidad & Tobago’. Question is, will a PP administration be reversing that corrupt decision? The strategy behind the bailout – Most importantly – ‘What is the strategy behind the bailout?’ On 31st March, there was a major press conference of the CL Financial leadership to announce the resignation of Dr. Euric Bobb and the appointment of Marlon Holder as the goup’s new CEO. The promise to provide accounts and a strategy was a key feature of that event and it is awaited. There are about 65 SPEs and the terms of the CL Financial bailout bring another 65 companies in that group within the umbrella of State control. That is a total of 130 companies and this could be an opportunity to re-shape the corporate culture of the place. The opposition leader has been noted for her sharp questioning of the real role of the SPEs, even going so far as to suggest that they are deliberately used to avoid the norms of proper accountability in the spending of public monies. The PM, Mr. Manning, also told us in his interview last Sunday that in some cases, the SPEs may have ‘cut corners’. Both those statements seem to signal an acceptance of the need to change, but we will have to wait to see what actually happens. Those interested in clico should have a look at the latest report on the demise of clico bahamas. It appears that this entity was owned by clico barbados holdings.